As you know from our previous blogs we had an amazing but roller coaster time at Hickstead CDI at the end of July/ beginning of August. In true Leo style we had a last place followed by a second and a first place! I still can’t believe we have now had our very first International win and National Anthem played. 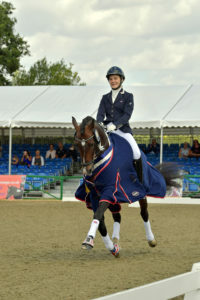 Quickly followed was the Sheepgate British Under 25 Dressage Championships, which is always brilliant. 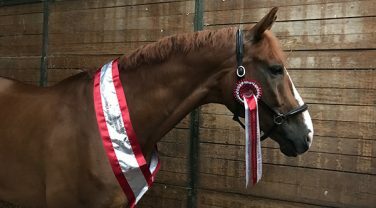 It’s one of our favourite shows and we won both the Pony FEI and the Medium level Championships. September was the annual GB squad selection assessments and I am pleased to tell you all that Leo and I were selected to be one of ten combinations placed onto the GB Pony Prime Squad for 2018/19. Autumn/Winter is our time for giving Leo a short break and then it’s training, training and more training to try and get us in the best place for the 2019 season, so I thought I would share some of what we do at the training weekends with the GB Pony Prime Squad. Our squad training weekends are held at the truly lovely Unicorn Equestrian Trust in the Cotswolds. Over the weekend we have a lesson each day with our GB Pony squad trainer Clive Halsell, then we have sessions such as team building, test reviews and personal goal workshops, physio assessments. There is also a review with the GB Pony Team Vet, Rob Oulton where Leo has things checked like his vaccinations, height checks , and general well-being and trot-ups. I also have reviews on my own personal core strength and fitness with the team personal trainer. In between that we have lots of chats sessions with each other and of course our team Chef D’Equipe Caroline Bell. As you can see from these pictures Leo has done his usual and decided for winter he no longer wants to be bay .. and black is the way forward!! Last weekend we popped out for a little competition practice and did the Pony FEI Individual Test at Vale View High Profile Show. It was really windy so the roof was rattling which was a little terrifying, but despite this I was pleased with Leo as he worked hard and scored a plus 70% test in such a tricky test. Leo has had a nutrition review and diet assessment by Dengie Performance Horse Nutritionist, Claire Akers. Coming into Autumn/Winter it’s tough as Leo goes from being in the field 24/7, to being stabled at night so his diet often needs a tweak. Pleasingly he seems to thrive on Dengie Alfa-A Molasses Free, and the Dengie Grass Pellets remain his favourite food ever, so he has a scoop of those in his stable mid-afternoon every day as he comes in from the field. Next up for us is more Squad training in December and sadly for me my second set of GCSE Mocks 🙈 so keep your fingers crossed!